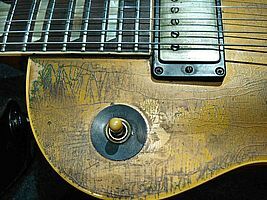 Snowy White's Gibson Les Paul Goldtop 1957 serial no. 7 2916. Headstock number 0382. This iconic guitar was acquired by Snowy in 1969 and has featured on every recording and performance since then, including the Pink Floyd 'Animals' tour 1977, the Pink Floyd 'Wall' shows 1980, Thin Lizzy 1980 - 82, the hit song 'Bird of Paradise in 1984, Roger Water's Berlin Wall show 1990, all the Roger Waters tours 1999 - 2013, and much more besides, including all Snowy's recording sessions for all his solo albums, and sessions for others, including the 'In The Skies' recording session with Peter Green. (The current bridge on the guitar was given to Snowy by Peter in the seventies). Snowy has owned this guitar for nearly 45 years, and for over 30 of those years it was his only instrument, played almost every day. Note: as a working instrument, this guitar has had a certain amount of repair and change, including rewiring, refretting and new tuning heads. Most of the original parts have been kept. This guitar is offered 'as seen', with no apologies from Snowy as to its current condition.